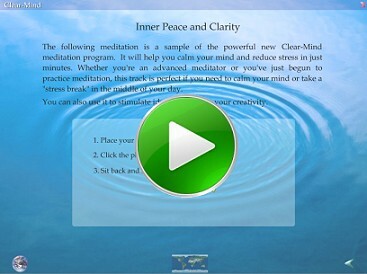 Meditation is now mainstream - people of all kinds use our Clear-Mind program to reduce anxiety, stress and tension. Time magazine now considers meditation as one of the most important things you can do for your health and well being. Get our free report on how Clear-Mind™ can help you calm your mind and reach states of deep calm and relaxation. "Clear-Mind is absolutely amazing. I've been through years of hypnotherapy and years of seminars - and I never, ever had the total sense of peace and centeredness that I get with Clear-Mind - and now I can there in seconds..."
"Clear Mind is fabulous. I can now go into a deeper meditation which I was previously unable to do. I'm now more relaxed and less moody and able to handle a stressful situation. I have already told my friends about your wonderful program. Compared to others, it's easy.....I tell them Paul is wonderful, and a very genuine man. This program is the best thing that I have done." "I love using Clear Mind - I actually schedule time in my morning when I arrive at the office, close my door and use Clear-Mind to meditate. I can feel the shift in my heart rate, the calmness that sets my day. I love the ocean so I feel right at home. I can set my intent for the day and off we go. I also use Clear Mind if I find myself in a difficult situation to calm me and to provide clarity. The difference it has made in my life is simply stunning."